“It’s been fun so far,” Vadeeva said after the Sparks practiced in New York this week. While she’s a rookie in the WNBA, Vadeeva has been playing professionally in Russia since she was 16. The 6-foot-4 center is on the Russian league powerhouse Dynamo Kursk that features her Sparks teammate Nneka Ogwumike and won the EuroLeague title in 2017. Coming to America was a little bit of an adventure for Vadeeva as she had visa issues and couldn’t get to the U.S. until early June — a month into the season. Her transition was made a little easier as her brother has been around to help her acclimate to living in Los Angeles. She’s shown flashes of her incredible talent despite not getting much playing time yet. She filled in well when Ogwumike was out with an illness, scoring 10 points and grabbing six rebounds in a loss to Atlanta right before the All-Star break. Sparks coach Brian Agler has liked what he’s seen so far from Vadeeva. He thinks she’ll get more playing time down the road and that she’s been hurt by the lack of practice time the team has had because of a condensed schedule. 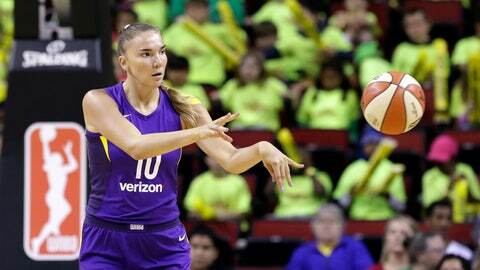 What’s impressed both Agler and Ogwumike is Vadeeva’s ability to score in the post. Vadeeva is the centerpiece of a core of talented young Russian basketball players. Once a major power in women’s basketball, Russia has fallen off lately, not qualifying for the Olympics in 2016 or the world cup this September. Vadeeva’s commitment to play for the Russia made a few teams shy away from her, knowing she may miss some time in the WNBA over the next few years during Olympic qualifying. “I hope I can play in the Olympics,” Vadeeva said. Before then, she’s enjoying her time in California, especially the food and beaches. “It’s very different than Moscow,” she said with a smile.